No matter how big or small your family may be, it’s likely that you spend more time at work, at school, and running to and from different activities than you do all together as a family unit. Sure, you gather for the occasional dinner in the dining room, and of course you spend holidays and special occasions together, but the day-to-day structure of your modern family is probably nothing like what it was when you were a kid. Calabasas Ca. based manufacturer, Elevate Customs, is changing that. Founded by sisters Marianna Lummer and Lorraine Spektor, they are taking the look and feel of traditional gaming tables, such as ping pong, pool and shuffleboard and shaking it up with exciting modern designs. Best of all they are bringing family’s together to do something they don’t do enough of…play. The question is, why aren’t family’s playing enough. We can blame it on the influx of technology or the onset of social media. We can say it’s because we’re struggling to find that perfect work/life balance or that we’re putting our energy into creating and maintaining the idyllic family home. But maybe it’s time to put those notions aside and focus on what’s really important—building our family relationships so that they thrive and get stronger as the years go by. When it comes to family, it’s important to have face time. And no, not iPhone Face Time—actual time spent face to face, having conversations, enjoying meaningful moments, and laughing together in the same room at the same time. Everyone has their own schedules to maintain and their own interests to pursue. It’s easier to eat at different times than to try to gather everyone together for a meal. It’s easier to watch a movie on your own tablet or laptop than to try and agree on one that the entire family can watch together. It’s easier to retreat to your own room than to convene in a shared space and have to carve out a comfortable space for yourself on the couch. But there’s one thing that just about everyone can agree is fun—family game night. Elevate Customs, a tight team of designers and craftsmen that work side by side in Calabasas, CA, has families everywhere rethinking the tried and true concept of game night. 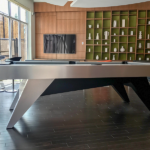 With tables that transform from dining surfaces to playable surfaces for pool, table tennis, foosball, and other much-loved games, Elevate Customs offers something for every family and every modern home—and does so with incredible style. These aren’t the game tables you find in dive bars and retro arcades—these high-end tables are designed to encourage hours of competition and weekends of tournaments that every member of the family can enjoy. We love the idea of hosting a weekly family game night as a way of creating memories and bringing the family closer together. Elevate Customs makes it easy to do just that without having to compromise on style. Handcrafted from natural wood and customizable to fit any color scheme or room design, the collection is perfect for the family with a discerning, luxurious eye for style. From Calabasas to Cape Cod, these game tables are designed to fit seamlessly into any modern home. It’s time we stop trying to convince ourselves that we are connected as a family because we text and tweet to let each other know where we are and what time we’ll be home. We’re as accustomed to viewing the world through digital screens and camera lenses as we are with our own two eyes. We’ve got hundreds of friends and followers on social media, but we sometimes take for granted the people who will actually be there when times get tough. Somewhere along the way we’ve let the technology that was supposed to bring us closer push us farther and farther apart. It’s time to put some of the emphasis back on real time spent with real people, and a simple family game night is an easy way to do just that. If you really want to achieve the work/life balance, strengthen your family bond, and grow together as a family unit, carve out some time, gather around the table to play a game, and spark playful competition amongst the people you love the most. Laugh together, smile together, and revel in each other’s company. Often, it’s these little moments that end up meaning so much. You can learn more about Elevate Customs by visiting them online.